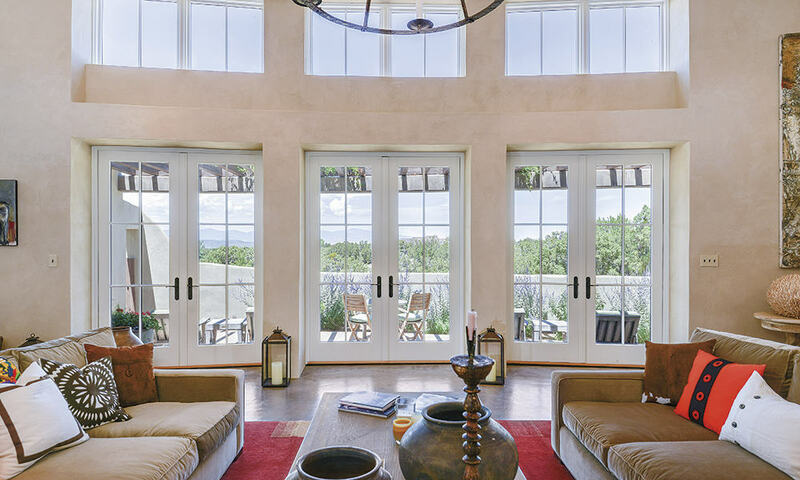 In Santa Fe's renowned equestrian community, Las Companas, a "nouveau adobe" reflects a modern perspective on traditional adobe design. 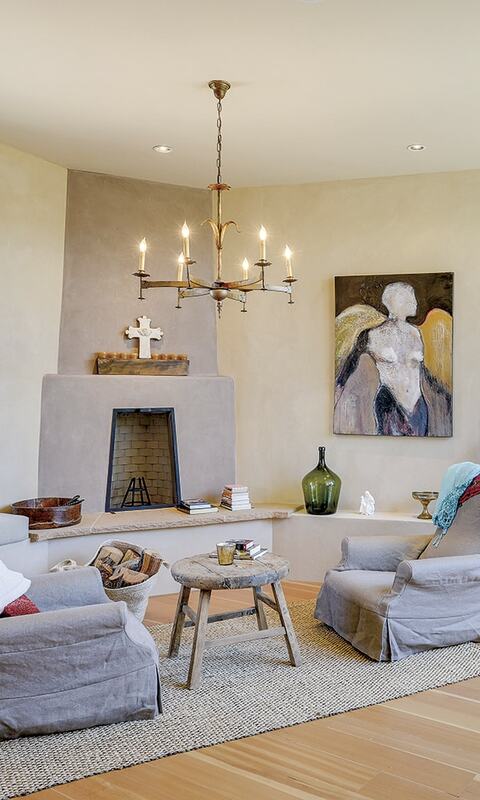 A palette of muted neutrals creates a comfortable canvas in a Santa Fe home whose bold splashes of blood orange and earthy, organic accents add sublime contrast to its casual, clean-lined elegance. Santa Fe is renowned for its artistic community and signature adobe style architecture; both reflect a deep and experiential relationship with the natural world. Here, a personal relationship with earth, sky, and water–as well as a reverence for the brilliant clarity of the New Mexico light—inform both art and architecture. Legendary architect Robert Nestor is a perfect example of this aesthetic, with an organic approach to capturing nature’s intrinsic majesty and melding it with the project at hand. His unique alchemy is exemplified in a Santa Fe project located in Las Campanas, an upscale club and residential community that also boasts its own equestrian center. The residence’s carefully structured rooms and well-thought-out details are the result of Nestor’s fifty years of fascination with the local landscape–its rocks, mountains, and skies—and his well-honed “philosophy of light.” Nestor also has what some may call a quirky but innovative practice of using the I Ching, an ancient Chinese divination process, to come up with variations on the perfect structure design. The fruits of his labor speak for themselves. The original owners found Nestor’s revered ‘locals’ status and “expertise in plaster and mud,” instrumental in creating the southwestern home of their dreams. Ultimately, the altitude proved to be incompatible with the couple’s health, and the home’s lucky new inhabitants are now the serendipitous recipients of countless wise and artful design decisions. 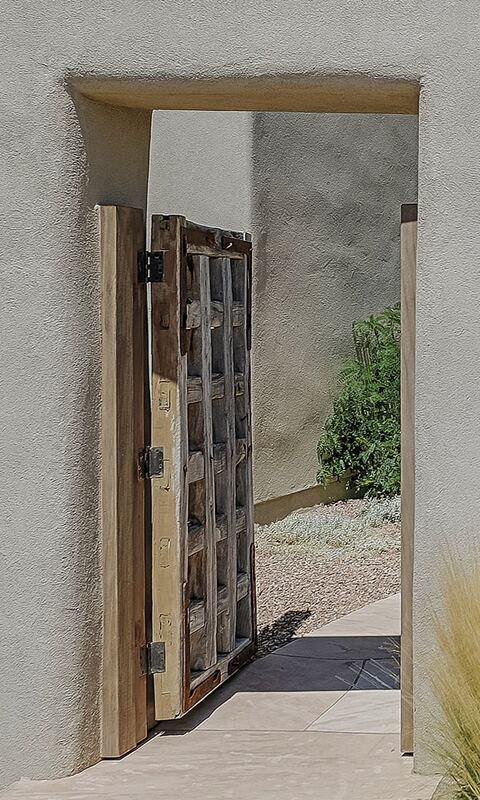 A salvaged, antique door serves as an entry gate, showcasing the home’s thick, adobe-style walls. One request of the original couple was that there be no right angles in the residence. They also wished to have some curvature in the walls, which demanded much creativity, particularly where cabinets were concerned. Builder Kurt Faust of Tierra Concepts, and interior designer Kevin Reiner, who had previously worked on the couple’s home in Ohio, joined the team to assist Nestor in manifesting the owners’ unique vision. Although many southwestern homes are built in the adobe style-an elaborate process on its own terms—few are actually true adobes. Authentic, historical adobes are generally about 20% more expensive to build, and are notoriously difficult to maintain. In fact “an entire wall can be lost in a manner of minutes” with severe rain, according to Nestor. An adobe-like structure was decided upon. Like a true adobe, many of its walls are 18 inches to two feet thick, but they are comprised of a nouveau mix of framing, plaster, sheet rock and more plaster. Chairs slipcovered in a putty, linen-like fabric, a blonde mocha fireplace and natural-edge flagstone hearth form a peaceful seating area in the master bedroom. An angelic being watches over the scene. A beloved collection of vintage doors found in the various architectural and antique salvage yards around Santa Fe also found a home in the modern quarters, lending a historical and colorful element. Polished concrete floors throughout much of the residence, vertical grain fir cabinets, and hand troweled plaster walls, along with stacked stone in the master bath, all contribute to a serene continuity, creating a calm and inviting space. A carefully curated art collection, and a lovingly collected iconographic assortment of angels grace the walls throughout the home. Each room has its own views: the Sangre de Cristos mountains or the Jemez range, the lush expanse of a nearby fairway and a view of the mesa, all encouraging the impulse “to slow down and be in the moment.” Whether watching a thunderstorm move across the horizon from the living room portal or gazing out towards the Rio Grande, the home’s intelligent design, meticulous craftsmanship and fresh take on the color wheel make for a perfect southwestern sanctuary.